The Francis Winspear Centre for Music is seeking to fulfill the City’s original requirements for the land and serve long-term needs identified by the community. What is now a surface parking lot will be transformed into 40,000 square feet of mixed-use new cultural space that integrates immersive arts experiences with practical commercial uses. The site is located in the heart of Edmonton’s Downtown Arts District, on the west side of 97 Street between 102 and 102A Avenues. 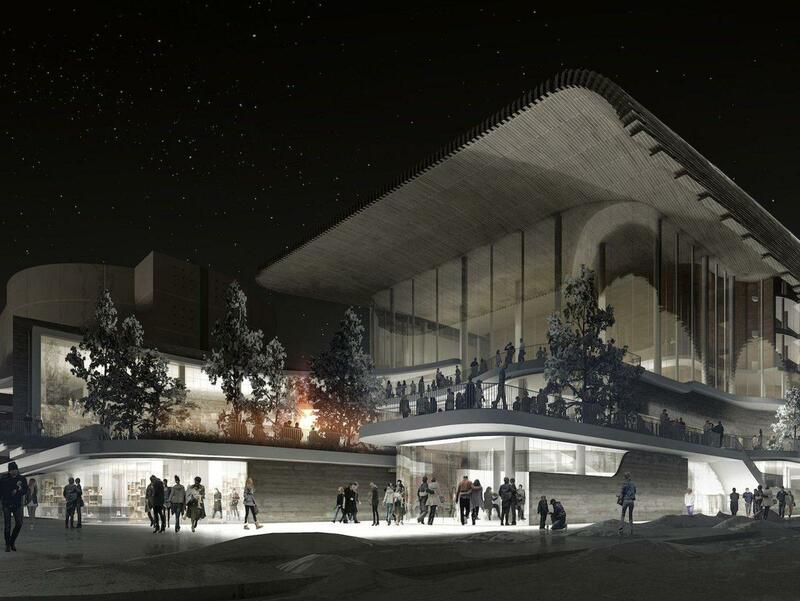 The architectural design will transform the now inhospitable corner of 97 Street and 102 Avenue, enhancing the beauty of downtown with people-friendly streetscaping and dramatic architectural design, and bringing the area to life with performers, children, and foot traffic at all hours. The project opens up possibilities for comfortable and safe pedestrian mobility in all seasons, from downtown to the River Valley, as well as indoor access to public transit and Pedway networks that connect City Hall, Canada Place, the Shaw Conference Centre, and Churchill Square. The Winspear sits on the doorstep of the Quarters and Boyle Street neighbourhoods and the Completion Project will unite Downtown and Quarters Revitalization. The Winspear Centre is a destination for locals and visitors alike, sitting atop bicycle parking, bus routes, LRT station, and the Pedway system. The completion project reinforces the Winspear Centre’s long-term strategic plan to increase community impact and engagement, viability, and operational capacity as Edmonton furthers its revitalization of downtown and strengthens the already vibrant Arts district.